WASHINGTON — Maryland Congressman Elijah Cummings, whose merciless interrogation of Michigan Gov. Rick Snyder at a recent congressional hearing on the ongoing Flint water crisis has drawn over 100,000 viewers on Youtube, said the Black Lives Matter movement needs to be in Flint because Snyder, Mich. Republicans and the governor’s supporters do not care about the lives of the residents of the mostly Black city. 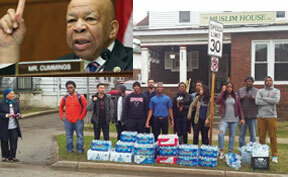 Cummings is the ranking Democrat on the Congressional Committee on Oversight and Government Reform, the congressional panel hearing holding hearings on the Snyder administration’s decision to switch the source of the city of Flint’s water and their response to the health crisis that ensued as a result. Cummings said it was clear to him during the meeting and after the meeting that Snyder and his fellow Republicans just don’t care about the people of Flint, which is 57 percent African American. Cummings said documents subpoenaed by the committee from the Snyder administration showed that they were aware of the full extent of the lead contamination in Flint’s water, and they disregarded it. “His chief of staff knew that there was a major problem for more than a year,” Cummings said. Apparently, his voice and others are being heard among Michigan residents. An EPIC MRA Poll released last month revealed that the governor’s approval ratings have plummeted. The poll found that 41 percent of voters believed he should resign, which is up from January’s 29 percent. It also found that 75 percent of voters believed Snyder didn’t handle the Flint water crisis well. A majority of recovery efforts in Flint are supported by volunteers and the federal government, he said. Several lawsuits have been filed against Snyder, including a federal racketeering lawsuit by hundreds of Flint residents that alleged the city’s water crisis was intentional and created to balance the city’s budget. The governor has used nearly one million dollars in taxpayer money to hire a law firm to help him maneuver through the civil and criminal complaints against him. Though Snyder cannot run for re-election in 2018, he is also facing recall efforts. The Rev. David Bullock, a Detroit pastor and activist, is one who has begun a petition to ask voters to end his term sooner by recalling the governor this November. Bullock has 60 days to amass 790,000 signatures to be in accordance with state law that requires a petitioner to collect the number of signatures equal 25 percent of the number of voted cast in the last general election. According to one newspaper, Bullock, who began his efforts Easter, has already collected an estimated 108,000 signatures. “I haven’t seen this kind of momentum in a long time,” Bullock told The Guardian. If the recall is successful, Michigan Lieutenant Governor, Brian Calley would serve the remainder of Snyder’s term.